Biologists noted in recent years that the three distinct species of finches were beginning to hybridize. Hybridization can produce hardier animals and is sometimes responsible for creating new species. Biologists speculate that the rarest of the three species—the large tree finch—has interbred with other finch species and finally hybridized itself out of existence, giving its genes over into the other Floreana finch populations. “The song of a large tree finch coming from the mouth of a medium tree finch could be a wail from the ghost of an interbreeding past,” Grant and Grant write, but no birds singing that song on Floreana have been heard in many years. Differences in beak shape, body size, and birdsongs only reveal variation among finches that has nothing to do with evolution into new kinds of animals. Kleindorfer’s analysis of DNA-sequence markers shows that currently there are now only two distinct populations of finches on Floreana, the small and the medium. DNA was of course unheard of when these three finch species were first identified on the basis of subtle differences in beak, body, and song. But DNA markers called microsatellites have since been associated with birds of the various species. (“Microsatellites” are not complete genomes but short repeated sequences useful for mapping kinship.) And now, careful comparison of beak morphology and body size shows that some individual birds combine features of the small and medium species, suggesting further hybridization is occurring. Thus it seems the three distinct species may well fuse into one. Biologists suspect that the introduction of a parasitic fly, Philornis downsi, 50 years ago may have driven the selection of hybrid birds once they appeared. The fly’s larvae kill finch nestlings. Hybrid finch nests sampled had fewer flies. Therefore the biologists suspect the hybrids are more resistant to parasitic predation by the flies. Darwin’s finches remain one of the classic examples commonly cited as proof of Darwinian evolution. Evolution of one kind of creature into another kind has never been actually observed, a problem evolutionists blame on the millions-of-years time scale they say it should take. But because variations that produce—and un-produce—different species of finches actually do occur and do so within an observable time frame, such changes are cited in textbooks and the press as prima facie evidence that molecules-to-man evolution also occurs. 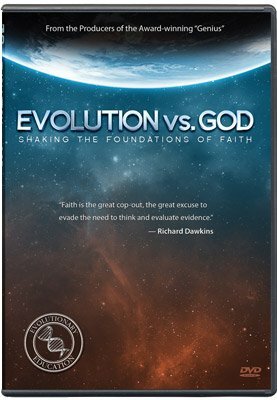 Finch evolution is even featured in a segment of a Biologos-funded online curriculum to indoctrinate students with the dangerously compromising doctrine of theistic evolution. 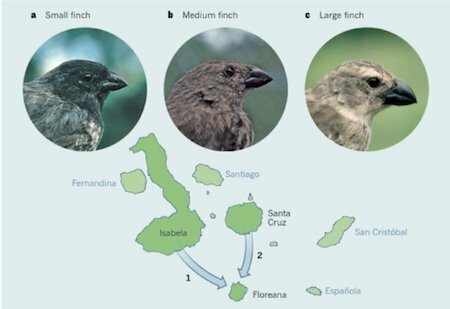 Formation of new finch species and the opposite species “collapse” should be viewed as the process of natural selection and other mechanisms working to preserve or conserve the finch populations on the islands. When I visited the Galápagos Islands, the park naturalist told our group that the finches seem to “sense” when a major weather change is coming (like an El Niño). Different species will mate producing hybrid finches which are more vigorous and able to withstand better the dramatic changes caused by these major weather events. It's amazing to think God has designed the finches with the ability to sense and respond to their environment in ways that we do not fully understand. While hybridization may eventually lead to the extinction of species, this is beneficial in helping the finch population as a whole to survive. It may not be very “politically correct” in our modern day era of preserving biodiversity but necessary for finch survival. Darwin’s finches provide fertile ground to study the mechanisms and results of both speciation and un-speciation. In God’s Word ( Genesis 1:20–23 ) we learn that God created all kinds of birds on the Day Five of Creation Week and created them to reproduce after their kinds. Consistent with this biblical truth, more than a century and a half of study has demonstrated that every finch species has still been a finch. It is therefore no surprise that they can resume interbreeding. Finch variation is often hijacked as “observational evidence” for evolution, claiming that the molecules-to-man evolution that is never observed would be if only given enough time. However, differences in beak shape, body size, and birdsongs only reveal variation among finches, variation that has nothing to do with evolution into new kinds of animals. What Are “Kinds” in Genesis? Susan Milius, “Charms of Small Males May Collapse a Darwin’s Finch Species,” ScienceNews, February 12, 2014, www.sciencenews.org/article/charms-small-males-may-collapse-darwin’s-finch-species. S. Kleindorfer et al., “Species Collapse via Hybridization in Darwin’s Tree Finches,” The American Naturalist 183, no. 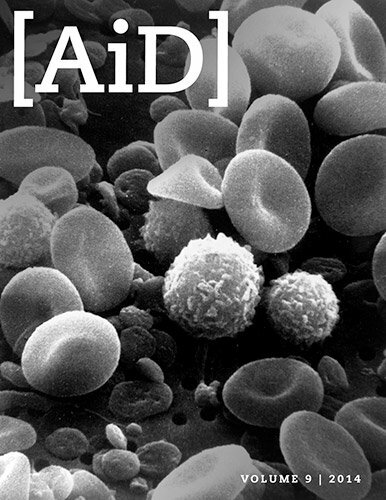 3 (February 5, 2014): 325–341, doi:10.1086/674899. Peter R. Grant and B. Rosemary Grant, “Evolutionary Biology: Speciation Undone,” Nature 507, no. 7491 (March 13, 2014): 178–179, doi:10.1038/507178b.